DMU2105 is a potent and specific CYP1B1 inhibitor, with IC50s of 10, 742 nM for CYP1B1 and CYP1A1, respectively. DMU2139 is a CYP1B1 inhibitor. 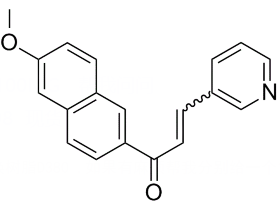 Deferasirox is an iron chelator, also a cytochrome P450 3A4 inducer, Cytochrome P450 2C8 inhibitor, and Cytochrome P450 1A2 inhibitor. Ketoconazole is an imidazole anti-fungal agent, a CYP3A4 and CYP24A1 inhibitor. Talarozole is a potent inhibitor of both CYP26A1 and CYP26B1, with IC50 of 0.46 nM and 5.1 nM for CYP26B1 and CYP26A1, respectively. NVP-VID-400, also known as SDZ285-428, is CYP24A1 inhibitor. TMS is a selective inhibitor of CYP1B1 activity. Rhapontigenin has been shown to inhibit the human cytochrome P450 1A1, an enzyme implicated in the biotransformation of a number of carcinogenic and immunotoxic compounds.